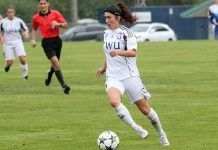 June 9, 2013, Victoria, BC (ISN) – The Highlanders men hit the pitch following the women’s 6-1 victory earlier in the day, lacing the boots against the Washington Crossfire in front of another strong crowd of 1306 fans. The Highlanders showed good jump to start the first half, with both teams exchanging corners in the opening 20 minutes of play, including close chances by Riley O’Neill, Blair Sturrock and multiple rushes by forward Brett Levis. A shot by Kalem Scott looked to be heading in when goalkeeper Spencer Richey managed to get a hand on the ball pushing it over the bar. Not to be outdone, Highlanders goalkeeper Elliot Mitrou stopped a blast from 25-yards out at the 32-minute mark. Four minutes later, Brett Levis broke in on a rush with Jordie Hughes, firing a shot that the Washington goalkeeper stopped, but Hughes would not be denied, tapping the rebound in past the keeper to put the Highlanders up 1-0. Minutes later another Levis shot was stopped with Hughes once again attempting to put in the rebound—this time with his head. Richey lunged to his left to make the save however, keeping the game 1-0. 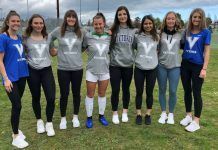 The Highlanders continued to keep up the pressure in the second half, but a breakdown at 58-minutes led to a Washington chance that went high. Minutes later, Sturrock would put on a display of footwork that ended with him firing a shot to the top left corner, the ball would also fly high however. A low cross by Andrew Ravenhill in the 78th minute bounced once before finding the foot of Levis, who this time fired it to the back of the net to put his team up 2-0. In the 84th minute, a miscue by Mitrou led to a great opportunity for Washington, however defenseman Ryan Ashlee made a beautiful slide, knocking the ball out of danger and keeping the shutout intact. The game would finish 2-0, with the Highlanders reclaiming top-spot in the division.